I went to see the Superman re-boot on Saturday night. My overall impression is somewhat mixed. I was really excited to get to finally see the movie, it’s been out for three weekends now. The first weekend I had an excuse to miss it, I had a very important wedding to attend. I have no excuse for missing last weekend other than I was really busy last Saturday. Henry Cavill stars as Kal-El, aka Clark Kent. We first meet him bearded working on a fishing boat. Within the first 2 minutes of the movie, we get to witness Superman save a bunch of men on an oil rig. Oh yea, and we get a close-up shot of his abs. I expected nothing less from you Zach Snyder, oh ye who gave me the movie 300. Amy Adams played Lois Lane really well. A bit of what was written for her was over the top for me… did she really need to be on the plane at the end, really??! But, she played it well. It is Amy Adams though, I’m pretty sure she could act with a brick wall. Diane Lane played Clark’s mom, also a good portrayal for a relatively small, but important part. I liked her reaction to her house being destroyed. Kevin Costner plays pa Kent. I’m not a huge Costner fan, but he turned in the serious performance that I’m guessing he was asked to provide. This movie had much of what I expect from a summer movie, including lots of fighting, the destruction of New York, sorry, Metropolis and tons of things exploding. I mean tons. Gas stations, skyscrapers, cars, tankers, spaceships, planes. You name it, it blew up in this movie. However, this movie also was much darker than what I was anticipating. Maybe I shouldn’t be surprised, Christopher Nolan (Dark Knight Batman writer and Director) was a co-writer of this and he tends to lean toward more serious themes. I suppose I just tend to like hero movies more along the lines of Avengers and Star Trek. While these movies wrestle with serious themes at times, they leave room for humor and some fun. Often this is accomplished with a little bit of snarky dialogue or funny interaction between characters. There wasn’t much if any humor to be found in Man of Steel, unless you laughed at the ab shot within the first two minutes like I did. Not saying I didn’t enjoy it, I certainly did, but it was just SO obvious. It had many redeeming qualities too though. 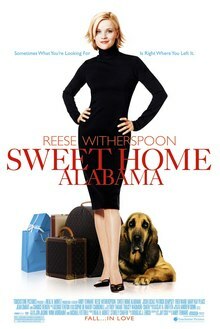 I enjoyed the back-story that was created for this movie. Having never read the comics, I don’t believe this is the original genesis story of Superman, but I liked how they portrayed Kal-El’s birth parents and home planet’s demise. The back story of how General Zod (played by Michael Shannon) came to be so bent on his mission also made sense. Yet another antagonist who might have noble motives, but attempts to meet his ends via destruction and evil. Overall it was a decent movie. Not my favorite super hero movie ever, it just could have been a little more fun and a little less serious in my opinion. To me, Batman exists in the darkness and Superman in the sun, so making this a bit darker just threw me off. But I’m glad I saw it in a theater. You just don’t get the scope of the special effects when you are watching a movie like this at home. And that’s half the reason to see this movie! I’ll give Henry Cavill some credit here as well, his performance was very good and he looked really good while doing it. Never would guess that he’s a Brit! If you are a fan of this type of action movie and are debating going or waiting to watch it, I’d still suggest seeing it in the theater. It is a movie best appreciated on the big screen. If you did see it, what did you think? Feel free to disagree with me! Earlier this week Jen, her husband and I visited Industry Public House in Lawrenceville. Yet another great Lawrenceville neighborhood restaurant, this one opened in 2012. I’m really kicking myself for not buying a house there. I seriously considered buying a fixer-upper there and am now thinking that I should have bought a place to rent out. Anyway, Industry Public house is located on Butler Street and is what I’d describe as a gastro-pub. They have an extensive bar menu with an impressive selection of beers on tap and more whiskey than I’d ever know what to do with. I ordered one of their beers, the Industry Copper Ale. It was a great mild beer. I’m not a fan of overly hoppy beers and this one was very minimal on the hops. On to the food! Their menu features great comfort food, right up my alley. 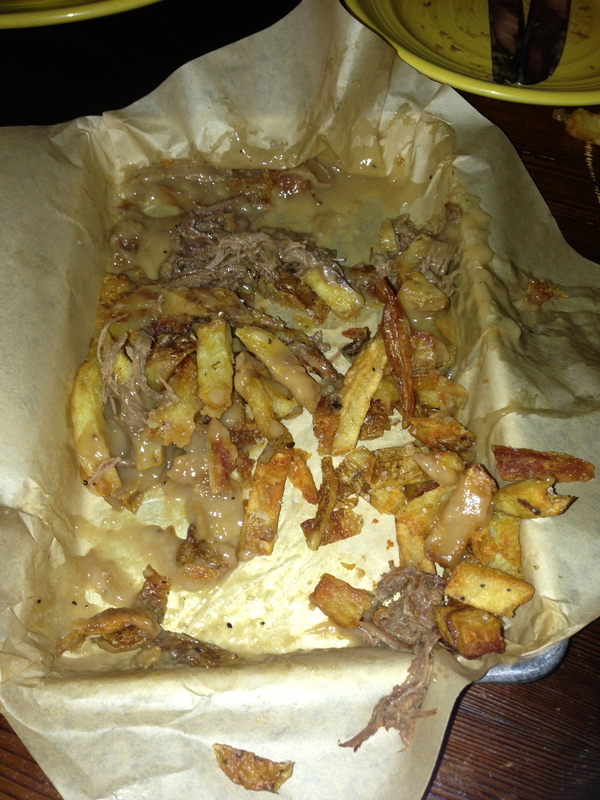 We decided to start with an order of their fries, they come in three different styles: truffle oil and gorgonzola, pot roast with gravy or melted cheddar and bacon. We opted for the pot roast and it was fantastic. It was so good in fact that we were pretty much done with eating them before I remembered to take a picture! So here is the aftermath. 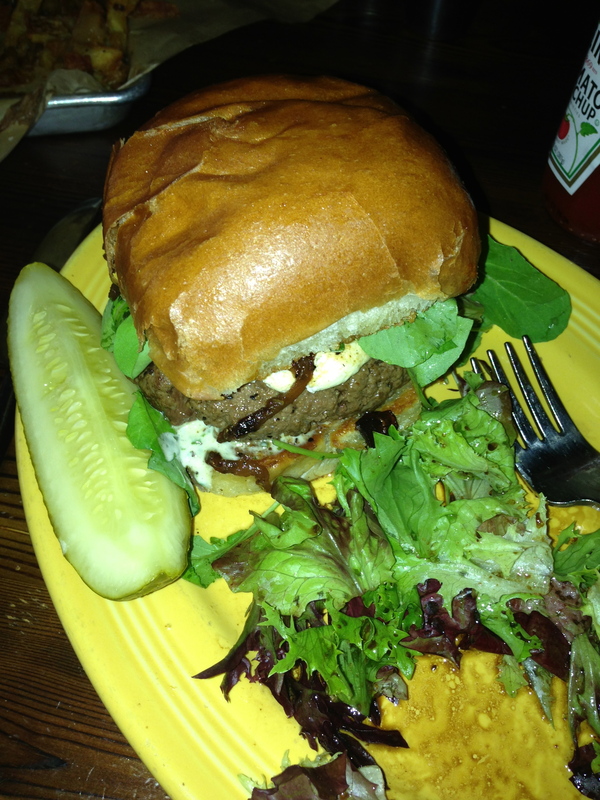 I ordered the Worker Burgher which had carmelized onions, goat cheese, wild mushrooms, arugala and a herb aioli. I figured when you go to a place with a burger menu like this one, that’s what you should order! 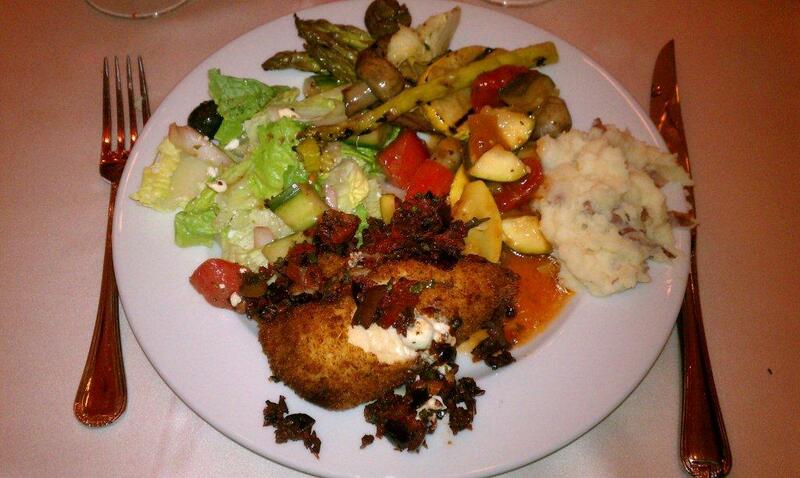 I did opt for a side salad rather than fries since we had ordered the pot roast fries as a starter. Jen opted to be healthy and ordered a salad and it looked so good. 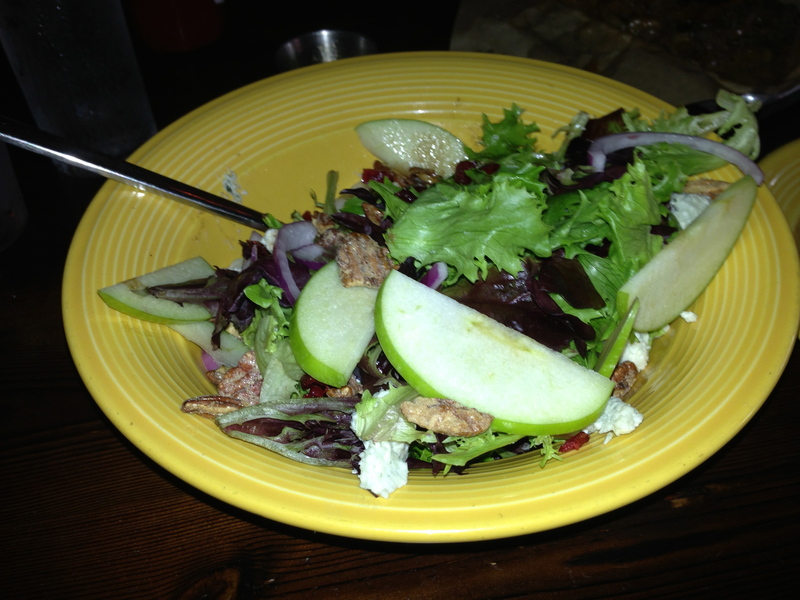 She got the company salad with granny smith apples, gorgonzola, dried cranberries, sliced red onion, candied pecans and a balsamic vinaigrette. It was a good sized salad and Jen said that it was very good. Those flavors go very well together so I’m confident that it was tasty. Jen’s husband ordered a cheese and bacon sandwich. He wasn’t overly impressed with it, but the bacon was really good. It was wild boar bacon and I tasted a bit of it. I really expected it to taste very gamey, but it wasn’t that way at all. It was done very well and just smokey enough. It could have been a little more crispy, but it was a thick cut of bacon, so that would explain why it wasn’t. I really liked it here, but I’ll freely admit that I haven’t been many places lately that I didn’t like. The service was okay, not extraordinary. This is the kind of place that I would love to come to after work for a beer and a bite to eat with friends. I would definitely recommend Industry as a great casual bar/restaurant and yet another place that I would visit again. 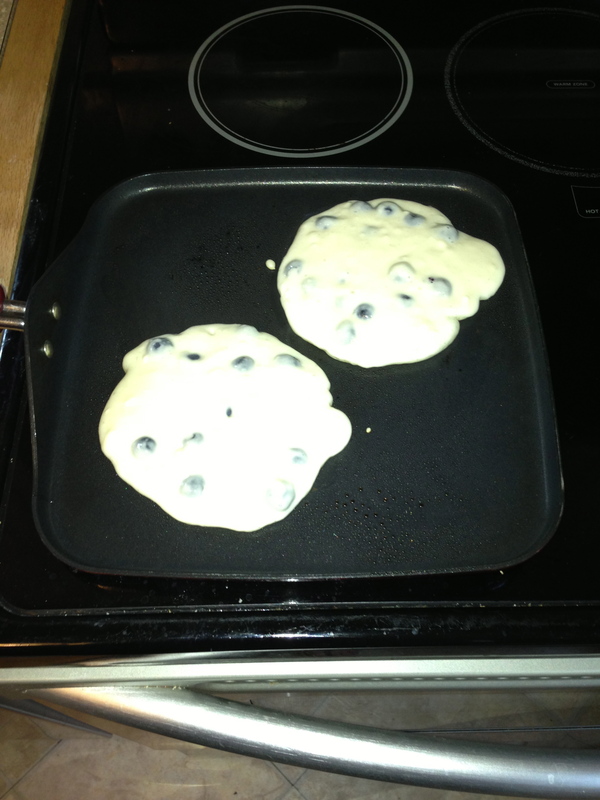 When I was in Orlando recently my friend Michelle over at Crazy Running Legs made Greek Yogurt blueberry pancakes. So while I got to snuggle with her new little guy Evan, Michelle made me some pancakes and made me really want to try these at home. So this past weekend I decided to go for it. These pancakes are packed with protein and low in calories and fat. Oh, and REALLY filling, it doesn’t take much. I’ll apologize in advance for the pictures, I used my iPhone and they aren’t that great, I’ll start to use my real camera when I cook! 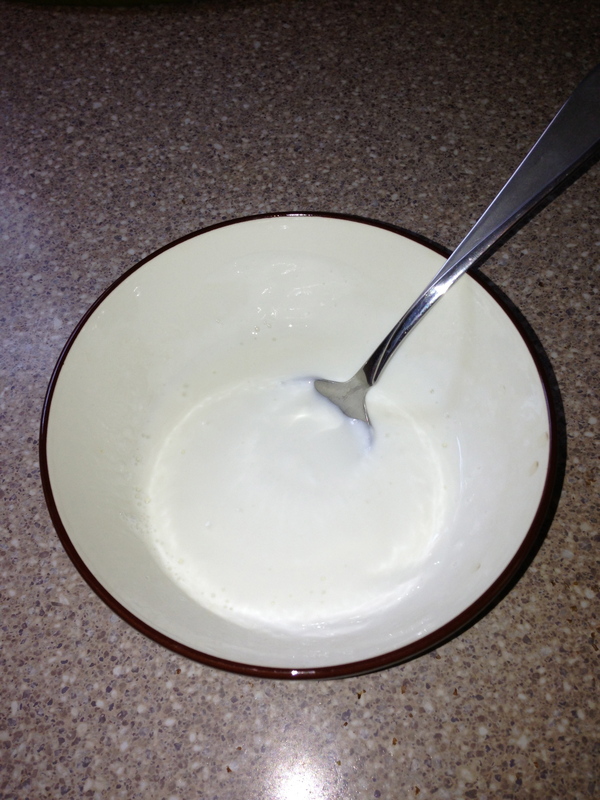 Mix together the egg whites and yogurt. 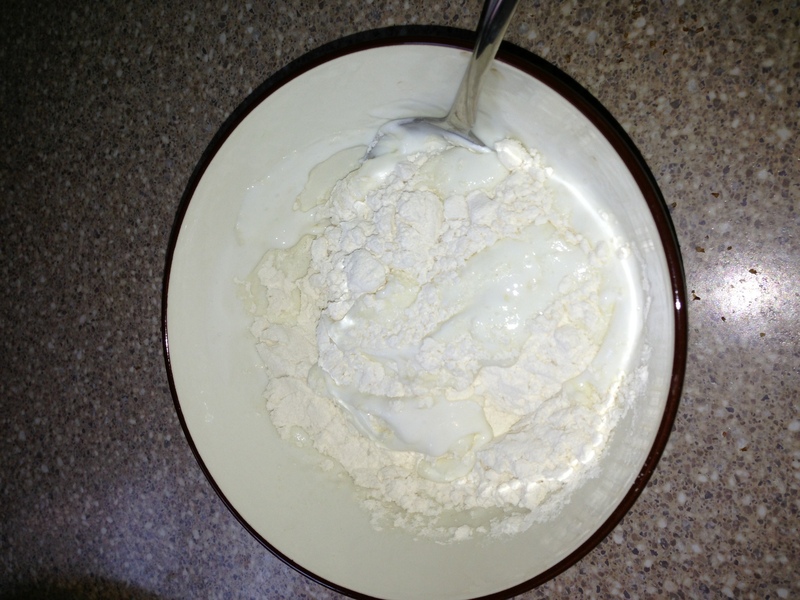 Then add in the flour and baking soda. I needed to add a little water to thin it out a little, but it’s up to you. 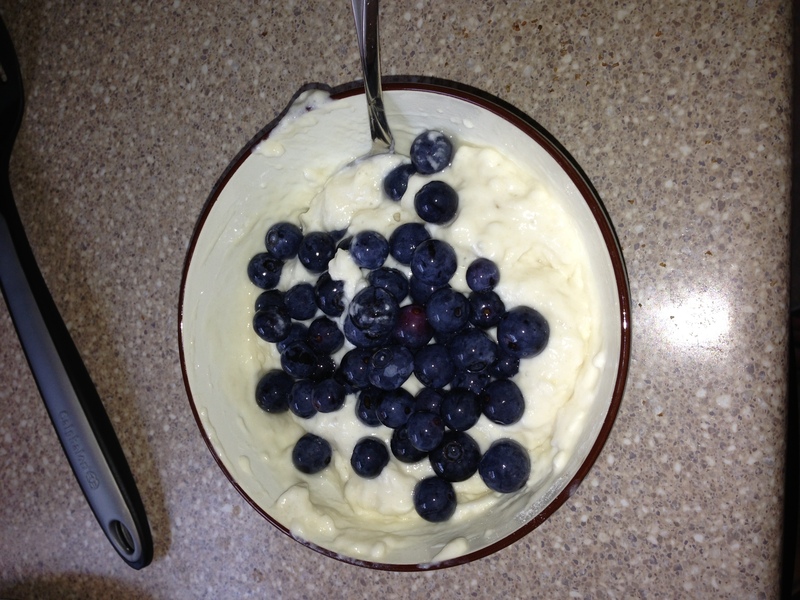 Just mix to combine and then fold in fresh blueberries. 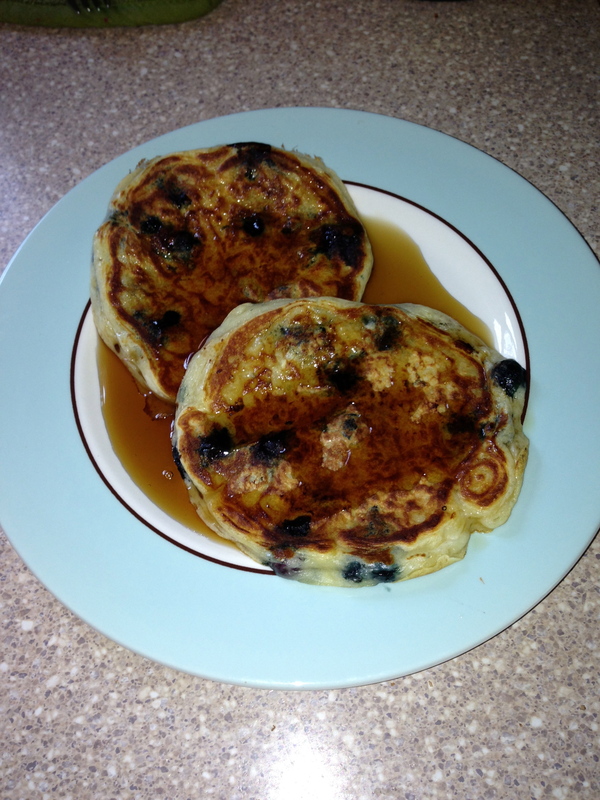 Some recipes that I saw online called for sugar, but I figured with the blueberries and the fact that I was going to use syrup, there would be plenty of sugar. Michelle used coconut oil on her skillet and it made her house smell awesome, but I didn’t have any so I just used regular cooking spray. While my pancakes were cooking, my cat stared menacingly at me because I had to put him in the cone of shame. 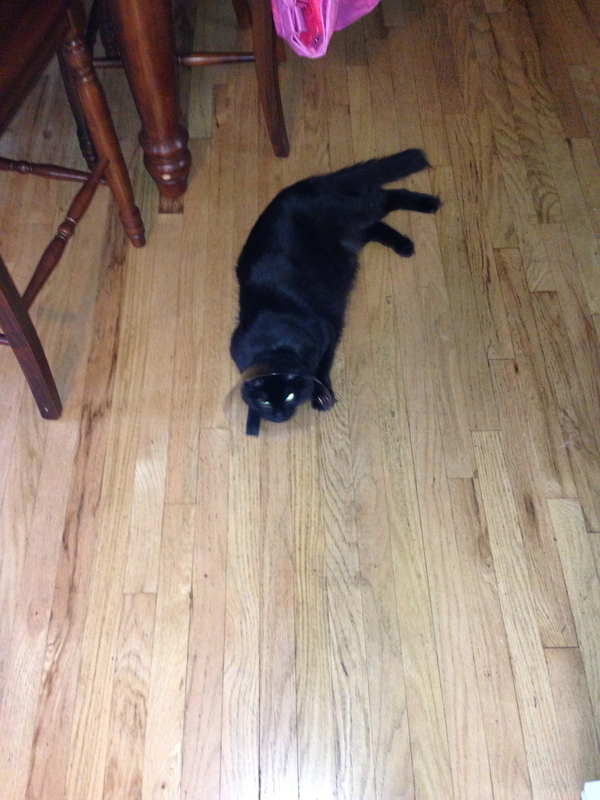 He had a scratched cornea and kept rubbing his bad eye, so I had to collar him to keep him from hurting it more. See the anger in those eyes, he’s still royally pissed at me. This recipe will make 2 very large pancakes or 4 regular sized ones. Either way, I’d call it two servings unless you are absolutely famished. I made one big one and two smaller ones. I put the larger one in the fridge and plan to eat it for breakfast tomorrow after heating it up in the oven. These come in at 226 calories and 0 grams of fat (depending on what you cook them in). These don’t taste like traditional pancakes, but they are an excellent, healthier option for a person who loves her carbs in the morning (me). And the 2 pancakes kept me full for a really long time. You can’t really taste the yogurt in the pancakes, so don’t worry about them tasting too tart. I think that this will be my go-to pancake recipe from now on so that I can get what I crave (pancakes) without ruining all of my healthy eating and working out! 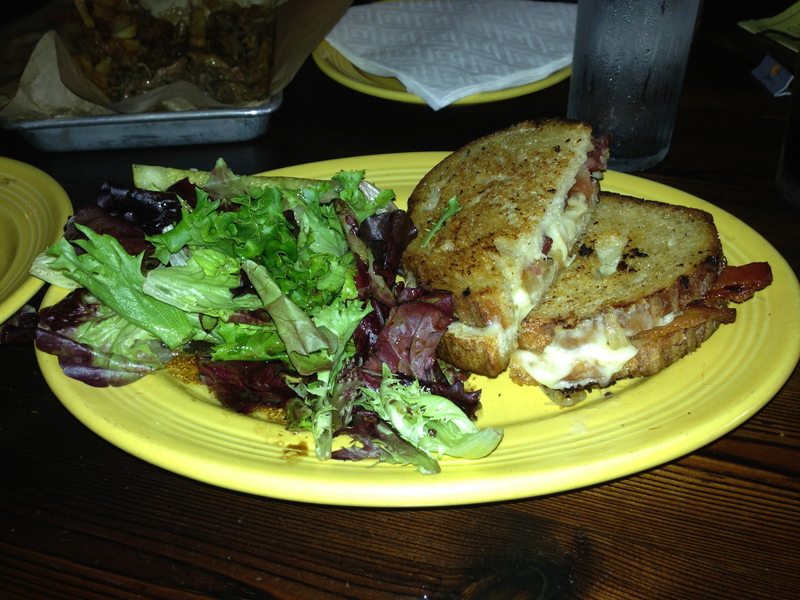 On Wednesday night, Jen and I went to this relatively new restaurant and bar in the Lawrenceville neighborhood. First I have to say how much I love that Lawrenceville has been reinventing itself over the last few years. Being back in the ‘burgh for two years now, I’ve been able to watch some of that transformation from a slightly frightening area with a run-down main street to a neighborhood bustling with art galleries, little clothing stores and lots of great restaurants. Our server told us that they were going to be changing the menu in the next few weeks. I think since they are a relatively new place they were trying some things out to see what worked and what didn’t. Their drink menu was really interesting and one of the people responsible for that part of the menu was also the creator of some very interesting drinks over at Meat and Potatoes. They all have really interesting mixers and spirits in them and equally interesting names. I ordered one called the Penny Farthing, which is kind of weird to say. 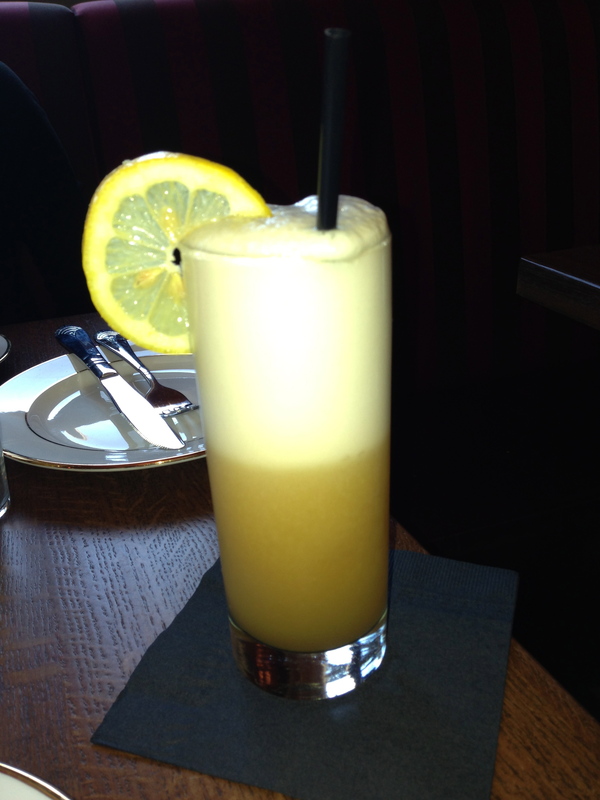 It had Gozio amaretto, Zaya rum, lemon, orange, egg white and sparkling wine. I know the egg white sounds weird, but it makes it very frothy. And I had a mixology lesson a few months ago (by the woman who helped create this menu mentioned above), so I wasn’t afraid to try it as she had taught us about a lot of seemingly strange mixers at that lesson. Most of the dishes here come on small plates so Jen and I decided to just order a few things and share. It was a very random selection, but the menu is still relatively small. We started off with some hush puppies and macaroni and cheese. I’ve mentioned in a previous post that I have a weakness for mac and cheese, it’s a problem, but since it’s not something I ever make at home, I don’t feel too bad about ordering it when I’m out. 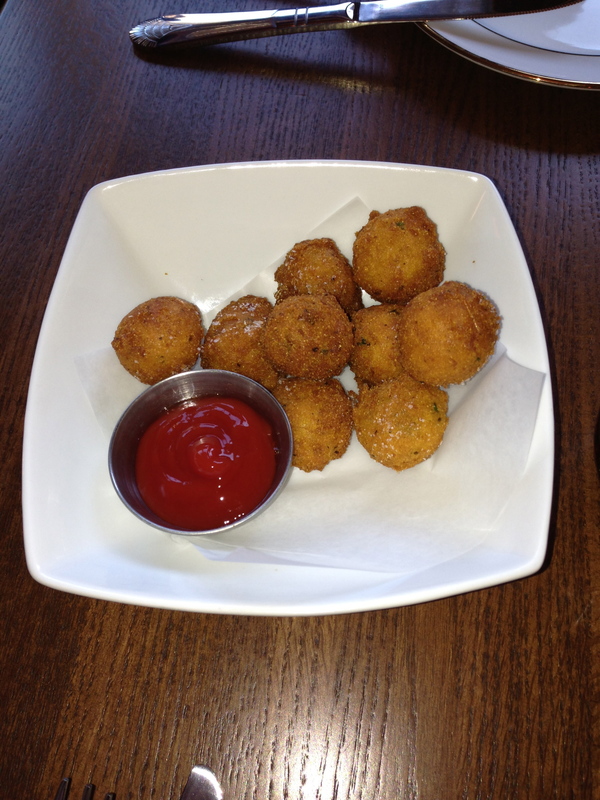 The hush puppies were very crisp and not overly dry as hush puppies can sometimes be. 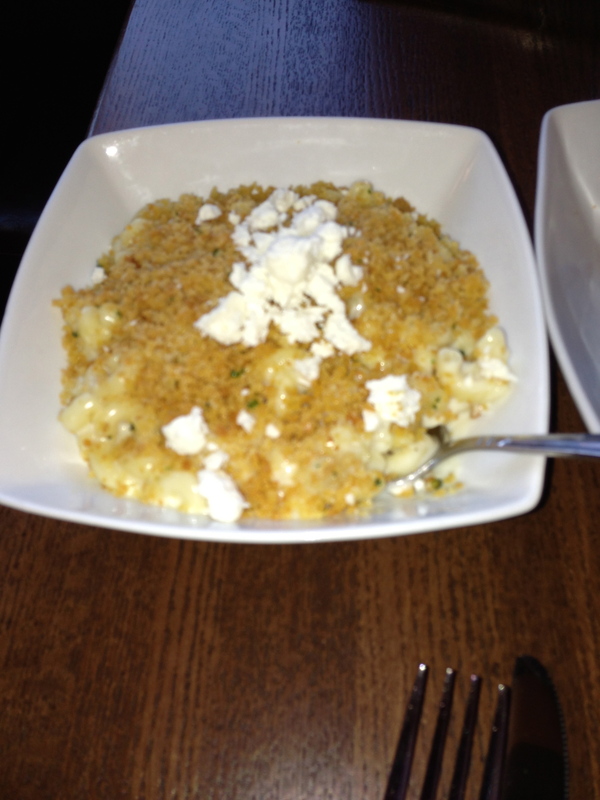 The mac and cheese was a great blend of several cheeses. Not being a cheese monger, I could not place them all, but there was one in there with some bite, it was very well rounded. 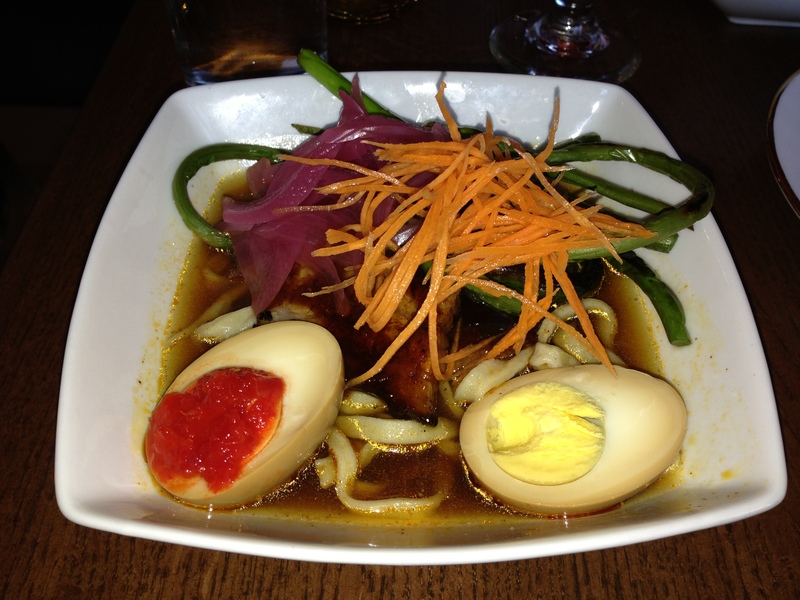 For our “main” dishes I ordered the lobster rolls and Jen ordered the yaka mein. 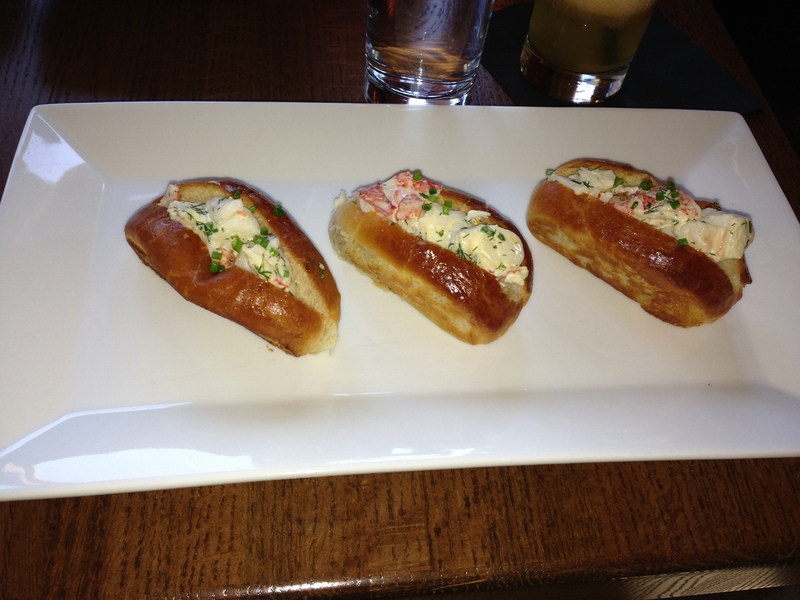 The rolls used for the lobster rolls was buttery and just a little crispy. The lobster mixture was flavored lemon and dill, it was very refreshing. The yaka mein was a little spicy and had homemade noodles. Jen’s only comment was that it was a little difficult to eat, not quite a soup and not quite a plated dish. The online menu has a moon pie desert and we were both very excited to try it out, however it was no longer an option for us at the restaurant. So we settled for the fluffernutter dessert. 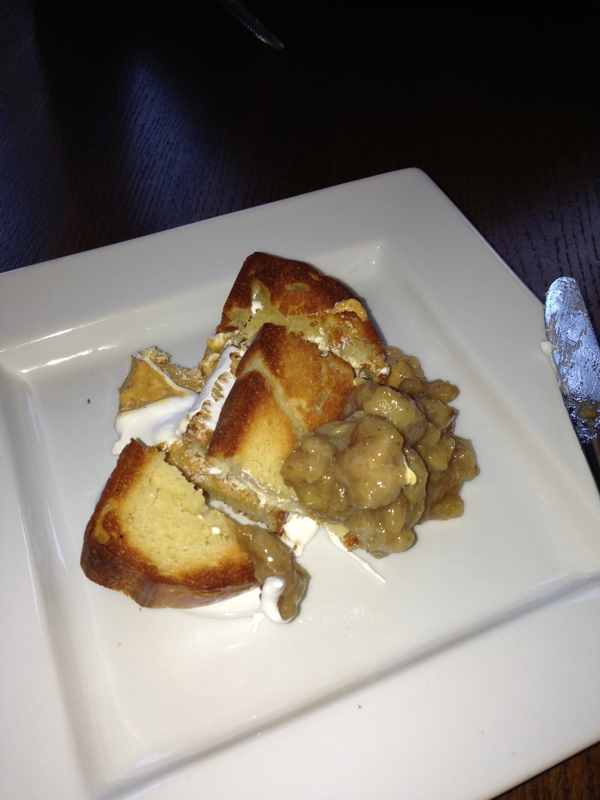 It had layers of whipped, creamy peanut butter and marshmallow fluff on toasted brioche bread. It was served with a petite banana mixture. The flavors really complimented one another, but peanut butter always goes well with banana! If you haven’t tried the little banana’s, pick them up sometime. They are much sweeter than a normal banana. We were both full at this point, so while I hated to leave it behind, we could not finish this one. Overall I really enjoyed my meal here. The overall atmosphere was really good. And aside from the table of doctors next to us making comments about all of the pictures that I was taking, I really enjoyed the ambiance. I’m curious to see what changes they make to the menu over the coming weeks, so this is definitely a place that I will visit again! This past weekend I had the honor of being a part of the wedding of one of my best and dearest friends. Marissa made a gorgeous bride and she and Dean are a beautiful couple. This was possibly the most fun wedding that I’ve ever attended. All the little touches that the two of them added made it unique and so very Dean and Marissa. This included all of the food of course! 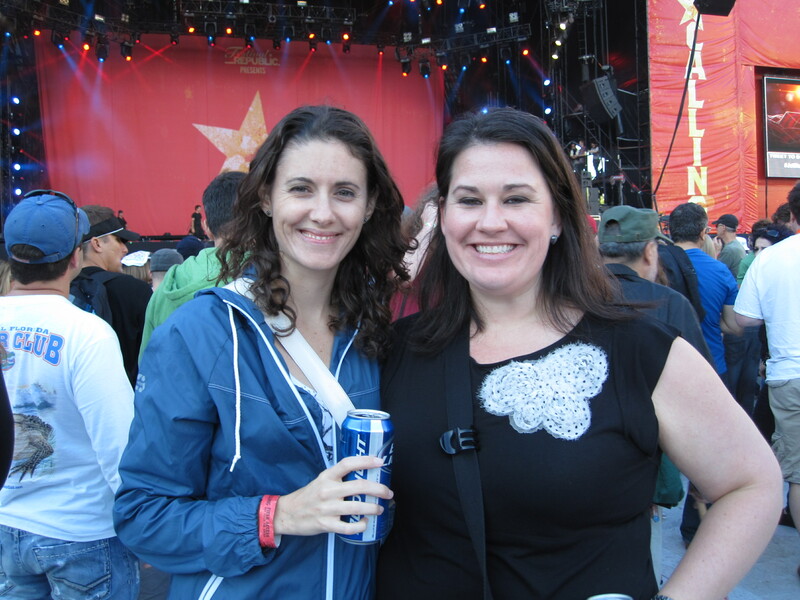 It was a weekend of friends, fun and food (and a little drinking, ok a good bit). It started with the rehearsal dinner of course. Marissa and Dean rented out a coffee shop in their Orlando neighborhood. The location was Downtown Credo, a very unique location. If you are one of my Orlando friends I encourage you to visit the shop and check out their website, they have a great business model focused on making a positive impact, both in Orlando and globally, as opposed to profit. They had the dinner catered by a local BBQ caterer, Ellie Lou’s Brews and BBQ. It was simply fantastic. 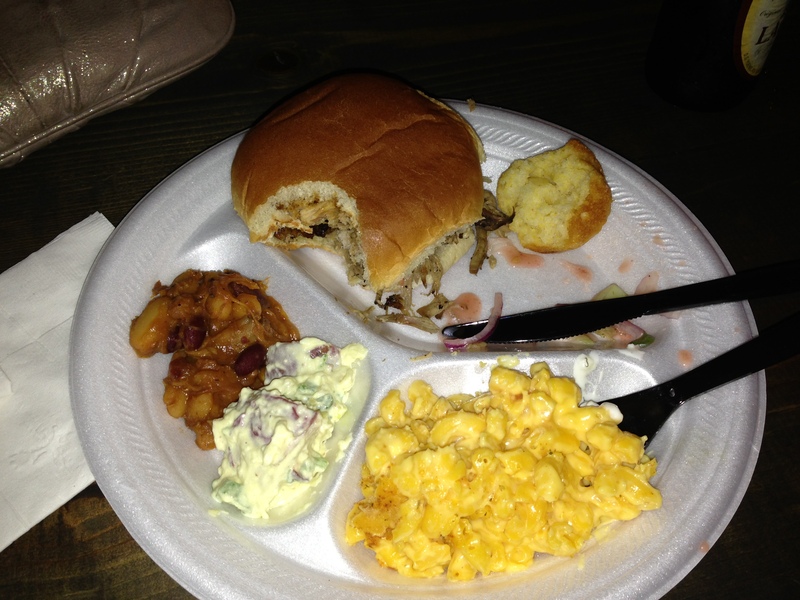 There were great bbq foods including beans, macaroni and cheese and potato salad, pulled pork and rips more. As you can see, I went a little overboard on the mac and cheese, it’s a weakness. Also, I ate my salad before I took the picture, I was a little hungry. They are currently looking for a place to set up a permanent restaurant and I sincerely hope that they are able to find one soon so I can have some of this food again during a future visit. 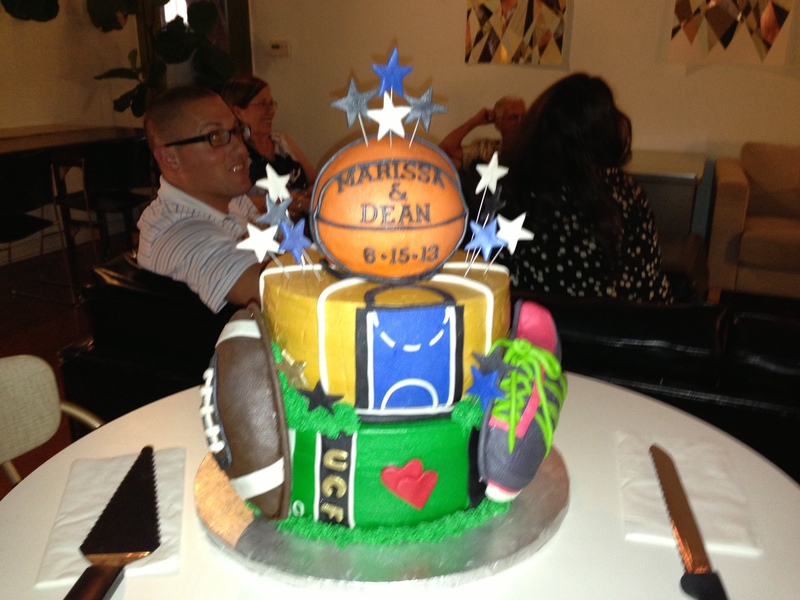 They also had a cake that contained several of their mutual interests including UCF, the Orlando Magic, football, basketball and running! The day of the wedding was fantastic and I only cried 2 times during the ceremony! I have to hand it to Dean and Marissa, they put together a fun wedding party. Living out-of-town, I hadn’t met any of Dean’s friends before but they were a blast. One of his buddies figured out that I have a weakness for champagne and made sure my glass was never empty on the ride from the church to the reception. After some pictures, we arrived at the cocktail hour at the Longwood Community Center. 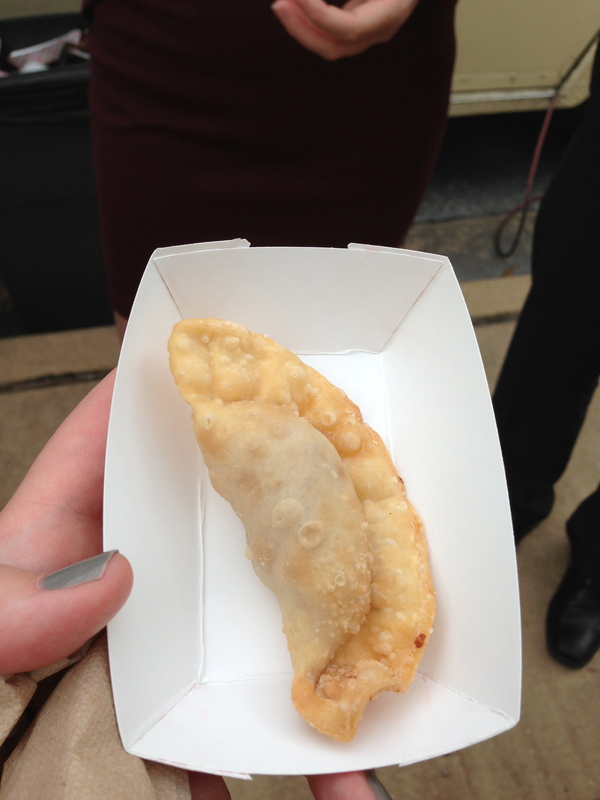 They had a local food truck, La Empanada, provide the food. The menu paid homage to Marissa and Dean’s heritage with both Greek and Trinidadian inspired empanadas. After our sports themed entrance, we had a speech from the father of the bride and then dinner. I’ll be honest, I was a little distracted during dinner and while everything that I had was very good, the thing I remember the most were the roasted veggies, they were fantastic. 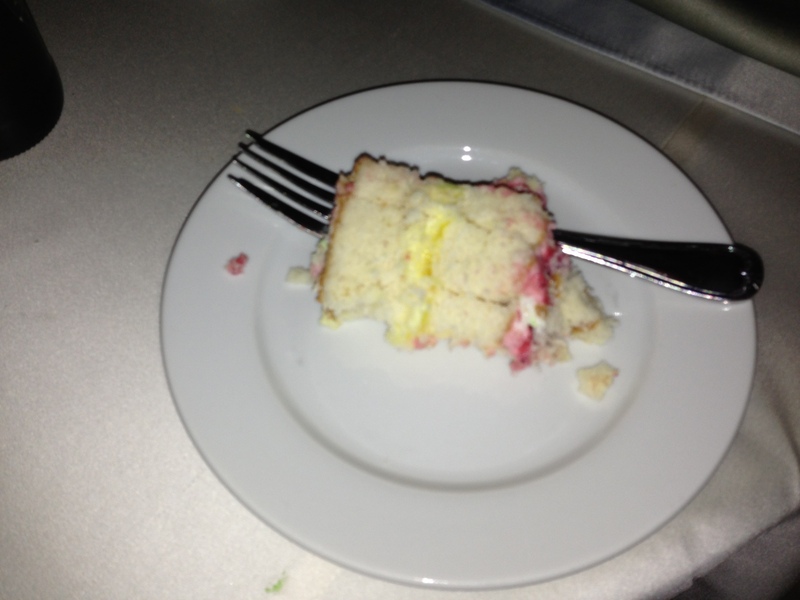 On to the most important part of wedding food though… the cake! I’m a cake snob, and this cake did not disappoint in the least. 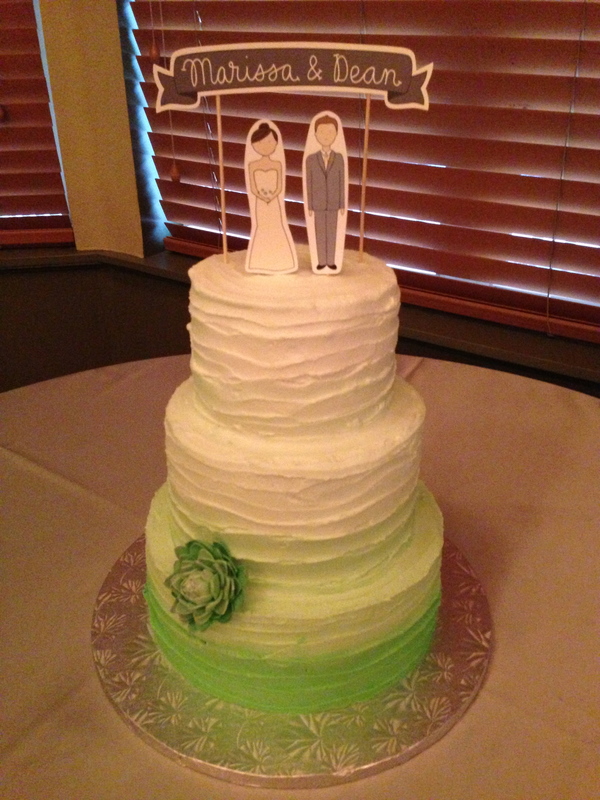 It was a cute cake that was simple and fun. The cake had a great custard and fruit filling. I could have eaten 3 pieces, no joke. 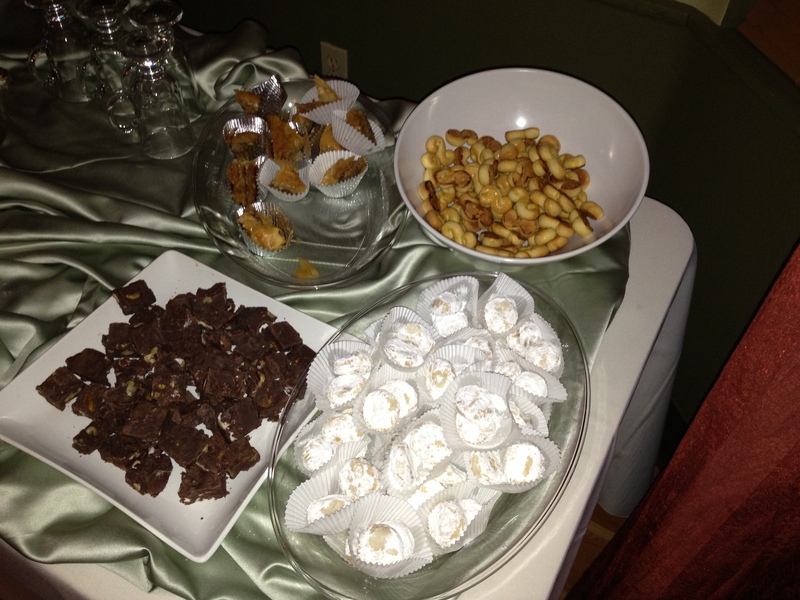 There was also a small table of Greek wedding cookies, fudge and baklava. After the cake, I attempted to dance all the calories off, though the amount I drank probably didn’t help with breaking even. But we all had a great time and that is what counts. I lucked out in that my food extravaganza did not end with the close of the wedding. Kim, a friend I met through Marissa invited me to her house on Sunday for homemade egg rolls and spring rolls. This was quite the experience and it was phenomenal. 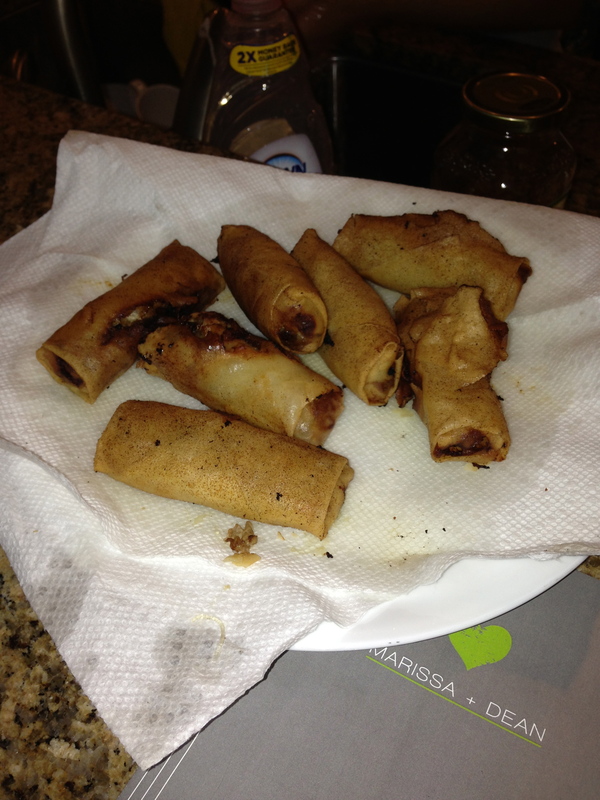 When I arrived Kim had fried up some of her mom’s homemade pork egg rolls as an appetizer. 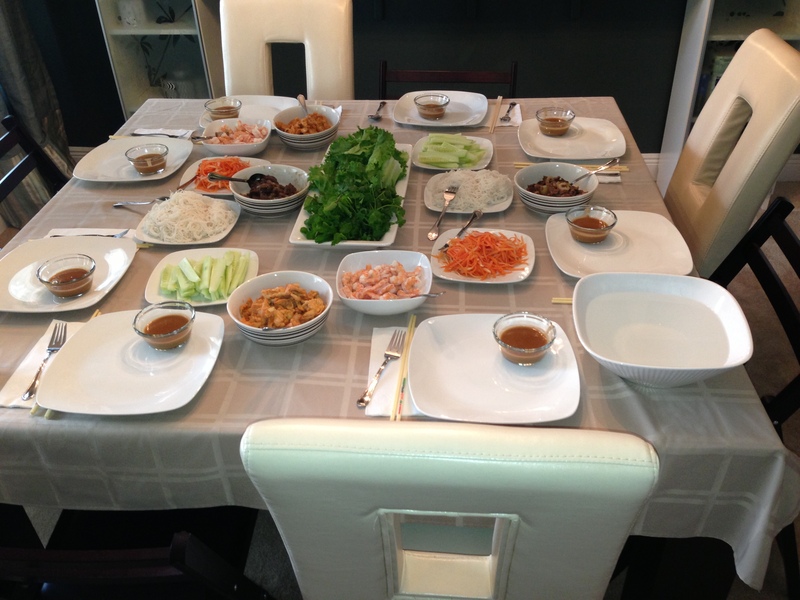 After that, 8 of us sat down to make our spring rolls. I have eaten these many times, but never made them. Well, assembled, Kim cooked all of the food for us in advance. 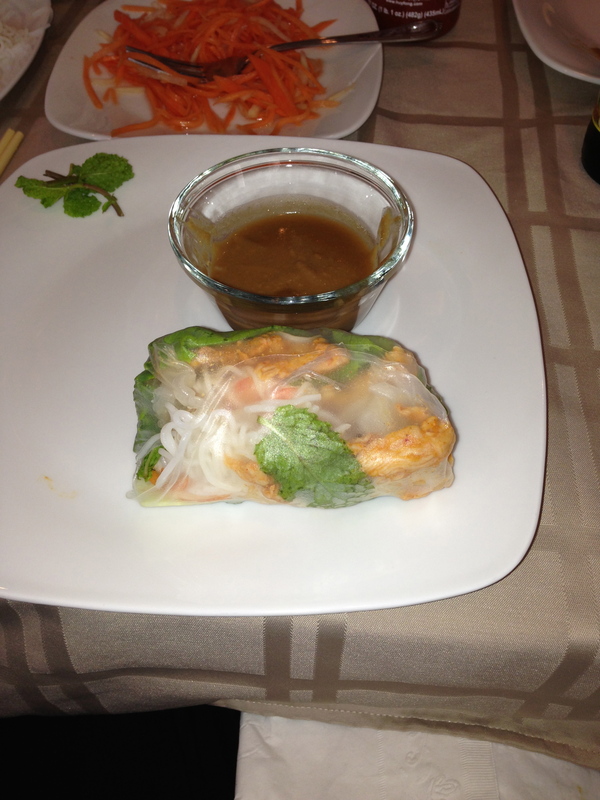 It was all so good and I ate two rolls. 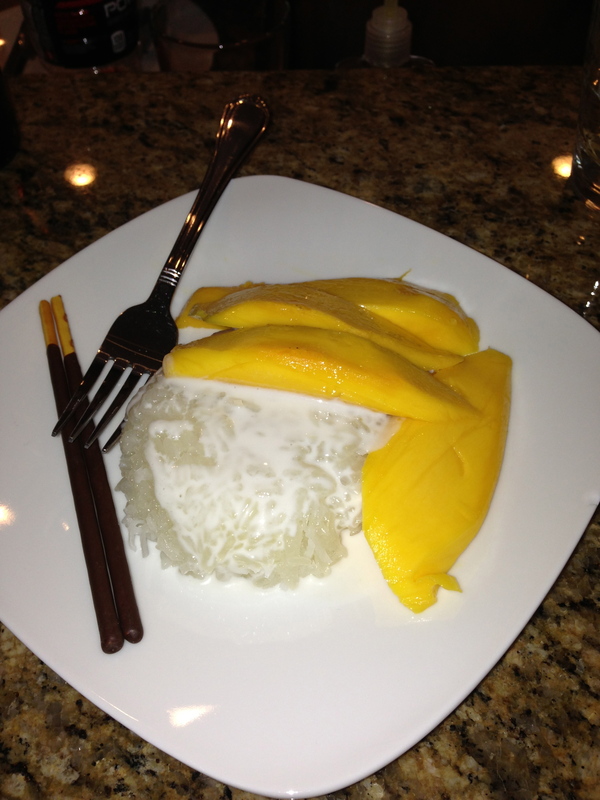 After the spring rolls, Kim made us mango sticky rice with coconut sauce. It was fantastic and if I hadn’t been so full I might have been able to eat all of it! Kim is also a food blogger over at Eat, Live, Eat More, so check out her site for her recipe’s, I think Kim will be posting the recipes from this session soon! I have to thank Marissa and Dean for putting together such a lovely weekend. I know it was a lot of work, but you started the rest of your lives off with a bang and I know you will be a happy couple for many many years to come. I love you both!! I’m about to be out of pocket for a few days as I celebrate one of my best friend’s wedding. This is Marissa and she’s getting married this weekend! 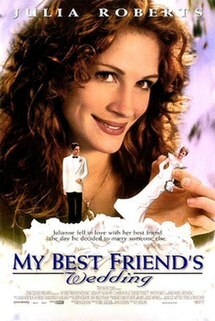 In celebration of Marissa getting married, here are some of my favorite movies about getting married! 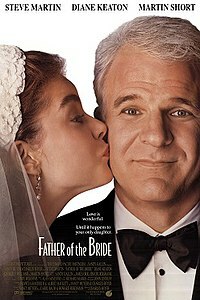 I personally like the 1991 version, mostly because of Steve Martin’s performance. He is hysterical in this and you can really see the frustration that can come with planning a wedding and how family dynamics play into it. This was hysterical when it came out and it still makes me laugh. It’s obviously a extreme example of how overwhelming planning a wedding when you have a VERY opinionated family can be. But as I’ve watched many friends plan weddings, I understand where the idea for this came from. Watching Julia Roberts make a fool of herself and Cameron Diaz sing at Karaoke is just hysterical. More Julia Roberts making a fool of herself. But the thing I remember most from this was the lesson about the eggs. If you take your eggs the same way as every guy you’ve ever dated while your dating them (egg white omelette for one guy, over easy for another and scrambled for yet aother), there is a problem. The meaning being that you need to know who you are and what you like before you can be with someone else. I love watching Adam Sandler do all those great 80’s covers for this movie. And all of the 80’s clothes! I also really enjoyed watching Adam win over the girl (Drew B) in this one, especially over the Miami Vice, white jacket wearing douche she was dating. Who doesn’t want to watch two people who obviously belong together be put through the ringer and almost marry the wrong person before FINALLY realizing that they belong together?! 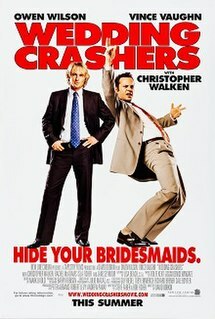 Vince Vaughn and Owen Wilson ham it up in this comedy. I can only imagine how many people went and tried to actually crash weddings after seeing this movie. For those of us who have been in a lot of weddings, we sit around wondering when it will finally be our freaking turn! Don’t worry girls, I haven’t saved my dresses, there will not be parade of bridesmaid dresses should I ever walk down the aisle. I only ever had one bad dress anyway! Honorable Mention to Mama Mia, even though I didn’t like the movie, I love the Broadway Musical. So I’ll throw it on here for all that great Abba music and a very cute story. So as I wish Marissa and Dean a happy marriage, I’ll be hoping that all of the wedding festivities go off without any of the hitches we saw in these movies. What do you think of my list, what are your favorite wedding movies?